Everyone knows that the Hi Lift Jack is one of the most versatile and important pieces of vehicle recovery equipment you can have while exploring the outback. Maneuvering and lifting your 4WD can be an invaluable ability in case you get stuck in the middle of nowhere. But the Hi Lift Jack by itself isn’t the most capable, which is why most people pair it with a couple of Hi Lift Jack accessories. Even though it works well on its own, using accessories alongside with it can greatly help improve its performance. For instance, one of the most popular Hi Lift Jack accessories among off-roaders is the plate base. The plate base ensures the Jack doesn’t sink into the ground as you’re trying to lift up your vehicle. 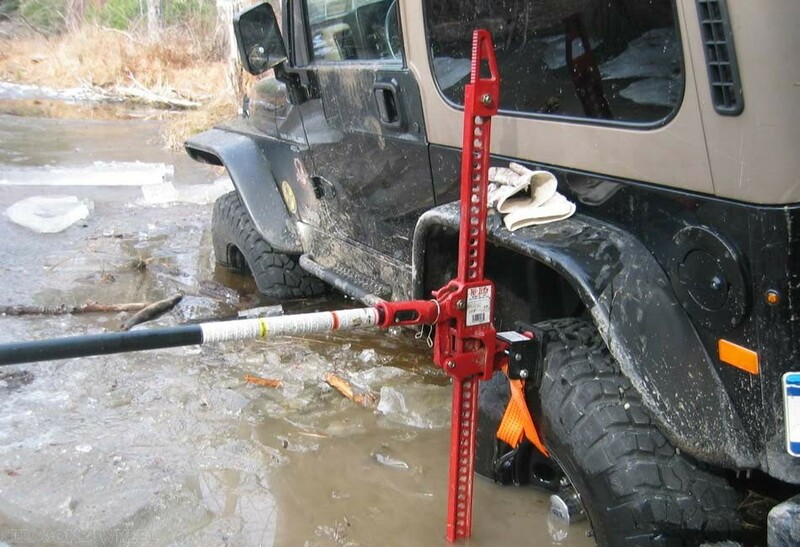 Mud, snow, and sand are all soft grounds that you’ll have trouble balancing your Hi Lift Jack on, which can pose a risk not just for you, but your vehicle as well. Most plate bases are lightweight, yet durable enough to handle the entire weight of your 4WD. Then, there are Hi Lift Jack covers that do a very noble, yet valuable job – protect your Jack’s climbing pins from dirt, rust, and the elements. Rust and dirt are one of the biggest problems with the Hi Lift Jack mechanism because if the moving parts get covered in dirt, they wear out faster and the Jack won’t lift smoothly. With that said, make sure you frequently lubricate the climbing pins as well, in order to prolong their lifespan for as much as possible. Further, there are accessories like the JackMate, which make the Hi Lift Jack more versatile and improve its existing abilities. The JackMate is generally used for farming, fire and rescue tasks, in industrial settings, etc. What it does is it replaces the top clevis/clamp on the Jack, adding extra functionality and strength. To put things into perspective, it has a working load of over 3-4T, which is far greater than the 300kg that the original clevis/clamp has. Additionally, it features a larger size clevis hole, a diamond plate pad that’s wider than the original, and a chain slot that comes handy for winching. Lastly, there are the Hi Lift Handle Isolators/Keepers whose purpose is pretty straightforward but important – they keep the bar and handle separate and steady. Without them, you may have trouble holding the handle in place and it will rattle with every bump you come across the trail.